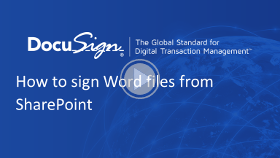 DocuSign Signature Appliance (formally known as CoSign) seamlessly integrates the number 1 digital signature solution with SharePoint on-premises. 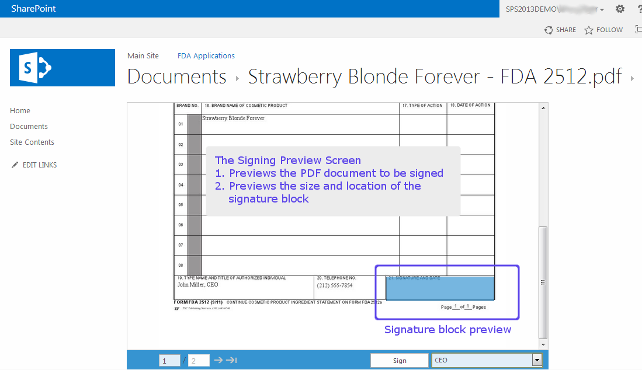 Adding digital signatures to SharePoint keeps approval-based workflows electronic from start to finish, streamlining processes while saving time and money. The connector can be integrated with K2, Nintex, and SharePoint Designer workflows. 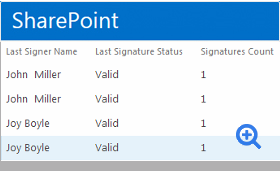 Easily sign, verify, approve, accept and audit documents, list items and records that are centrally located on the SharePoint server via a web browser, without installing any software on the client machine. Digitally sign all major document types including Word, PDF, Excel, and InfoPath. 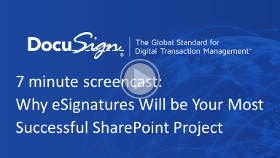 Digitally sign SharePoint documents via desktop, laptop, web browser and mobile devices. Tightly integrated with K2, Nintex, and SharePoint Designer workflow solutions. 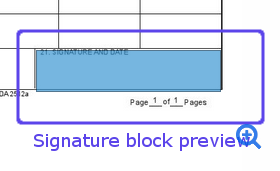 The Document Preview dialog enables the signer to preview the PDF, Word, or Excel document before signing. 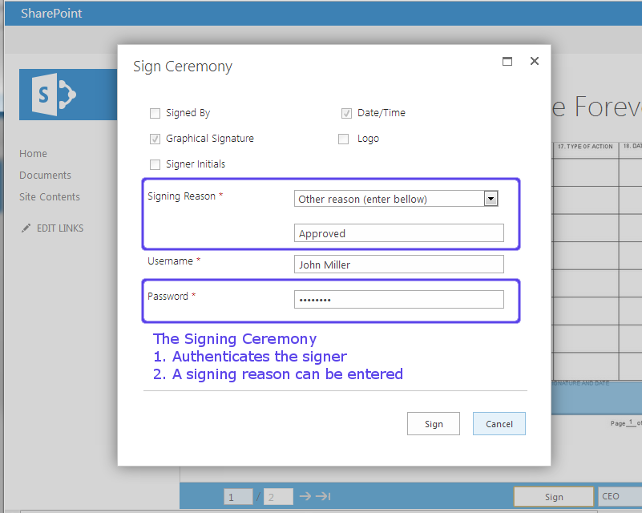 If authorized, the dialog is also used choose from existing pre-defined signature locations or to dynamically move and resize the location of the graphical signature. 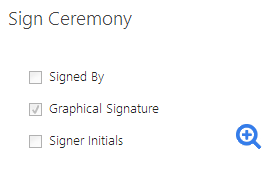 The Signing Ceremony enables the signer to choose signature options, authenticate himself, and sign the document. 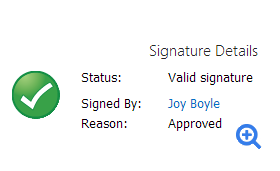 Signing options can also be managed by using signature profiles. 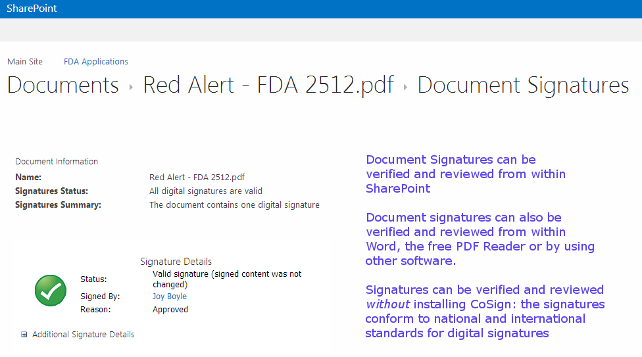 From within the SharePoint user interface, documents' digital eSignatures can be verified and reviewed. Documents' signatures can also be verified and reviewed by using the appropriate native application: Word, Excel, and free PDF viewers. SharePoint Server for DocuSign Signature Appliance automatically manages and updates signature-related metadata fields for documents and data. The metadata tracks the overall signing status of the document, the last signer, the timestamp of the last signature, the number of signers, and more. 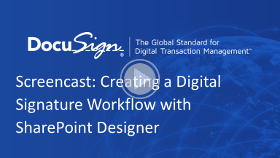 DocuSign Signature Appliance is seamlessly integrated with the most popular tools for SharePoint workflows: SharePoint Designer, K2, Nintex, and Visual Studio. You can easily add signing tasks to workflows using the tools' drag and drop user interfaces. Installation and User documentation for the connector. SharePoint Server for DocuSign Signature Appliance is built and supported by DocuSign, Inc. For more information, contact the DocuSign sales team today. The connector is available for SharePoint Server 2013, 2010, and 2007. Additional software is required to integrate with Nintex or K2. 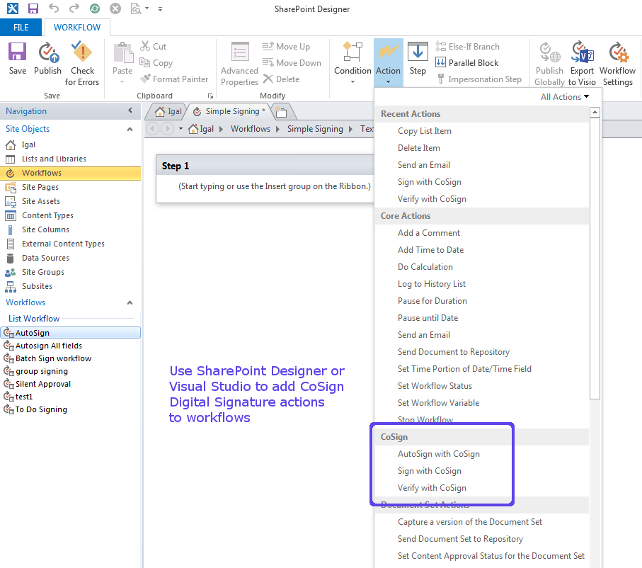 Related DocuSign Signature Appliance products: SharePoint Online for DocuSign Signature Appliance, Nintex Workflow for DocuSign Signature Appliance. 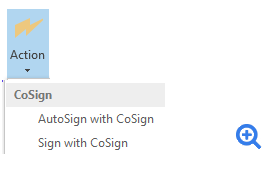 SharePoint Server for CoSign Central automatically manages and updates signature-related metadata fields for documents and data. The metadata tracks the overall signing status of the document, the last signer, the timestamp of the last signature, the number of signers, and more. The Document Preview dialog enables the signer to review the PDF, Word, or Excel document before signing. If authorized, the dialog is also used choose from existing pre-defined signature locations or to dynamically move and resize the location of the graphical signature. CoSign Central is seamlessly integrated with the most popular tools for SharePoint workflows: SharePoint Designer, K2, Nintex, and Visual Studio. You can easily add signing tasks to workflows using the tools' drag and drop user interfaces. This screenshot shows the available workflow tasks from the SharePoint Designer action palette. Please note that additional connection software is needed to enable K2 and Nintex integration.